A regular permanent resident in southwestern and western agricultural regions. The Gray Partridge was a rare species during the Minnesota Breeding Bird Atlas (MNBBA). Found in the upper Great Plains from Minnesota and Iowa west to Idaho, western Oregon and Washington, and north to southern Alberta, Saskatchewan, and Manitoba (Figure 1). Game species that is managed and regulated for hunting. Introduced to North America in early 1900s, native to Europe and Asia. Insects, seeds of domestic crops and weeds, and leafy greens. Ground-scrape usually lined with grasses in hayfields, pastures, fence rows, shelterbelts, and roadsides. Large clutches with an average of 17 eggs in the first clutch (10–22). Breeding distribution and relative abundance of the Gray Partridge in North America based on the federal Breeding Bird Survey from 2011 to 2015 (Sauer et al. 2017). Introduced into Minnesota from northern Iowa around 1913 in the southern tier of counties from Martin County westward (Roberts 1932). Roberts surmised that the successful introduction came from about 6,000 birds released in several places in Iowa, where the greatest success was achieved in the northwestern portion of that state (Spiker 1929). Roberts further documented 89 introductions of 8,556 birds primarily in the southern portions of Minnesota from 1926 to 1929. Apparently good reports of successful introductions were received in most cases. Note that this was not an inexpensive process; the 1,000 birds received from Czechoslovakia in 1929 cost $6.25 each (or $6,250 total), a considerable sum at that time. More than forty years later, Green and Janssen (1975) documented that it was most numerous in the southwestern part of the central region of Minnesota. It is “scarce north of Polk County, southeast of Olmstead County, and along the eastern margins of the central region.” They stated that hunting began in 1939 and peak numbers were harvested in 1958. They described confirmed nesting from 17 counties ranging in a triangle from Nobles and Pipestone Counties in the southwest, northward to Polk County, and southeast to Olmstead County. It was not found northeastward from Chisago County to Roseau County in the heavily forested regions of the state. Janssen (1987) described a similar distribution in Minnesota and emphasized the high annual variability in its population, with peak numbers in the late 1970s and early 1980s; however, the population numbers have declined since 1984. He also points out eastward expansions into Houston County in the extreme southeast, into Anoka and southern Mille Lacs Counties in the central region, and into Beltrami and Hubbard Counties in the northwest regions. Janssen included confirmed nesting from 28 counties since 1970, including confirmed eastward nesting in Benton, Houston, and Sherburne Counties not previously reported by Green and Janssen (1975). Hertzel and Janssen (1998) completely documented confirmed nesting of the Gray Partridge throughout its breeding range of 64 counties. These included positive nesting in Morrison and Roseau Counties, and in Washington County on the eastern margins of its breeding range. The Minnesota Biological Survey has recorded 28 breeding season locations all within its known breeding range. Highest concentrations were located in extreme southwestern Minnesota in Lincoln, Murray, Pipestone, and Rock Counties, each with multiple locations (Minnesota Department of Natural Resources 2016). The MNBBA recorded a total of 96 records in 1.8% of the blocks (86 of 4,755) or 2.0% of the priority blocks (47 of 2,337) (Figures 2 and 3; Table 1). The distribution included the same regions described above. Most observations were restricted to the southwest and southern regions or in the northwestern regions of the state. No observations were recorded in the central or northeastern regions. Confirmed nesting was reported from 5 blocks in the counties of Freeborn, Marshall, Swift and 2 in Yellow Medicine. All were previously reported by Hertzel and Janssen (1998). The species was not abundant enough during the atlas period to make further predictions on its distribution in the state. In his review of the Gray Partridge in North America, Carroll (1993) reported the species had been released into more than 30 states and provinces during the late 1800s and early 1900s. The most successful were in Alberta, where they spread into Saskatchewan and Montana. Since the 1950s its range has retracted in the eastern United States and Canada, while it has gradually expanded in the prairie states, including southward into Nebraska and Missouri. Mettler (1977) summarized that Gray Partridge populations and its range in Minnesota have expanded from relatively low populations in the 1950s and 1960s. She explained that as the Ring-necked Pheasant population declined in the 1960s, the Gray Partridge population began to increase in the 1970s. These reciprocal changes are not completely known but may have been due to interspecific competition or weather-related issues. For instance, Gray Partridge prefer drier weather conditions, while Ring-necked Pheasants prefer wetter conditions. 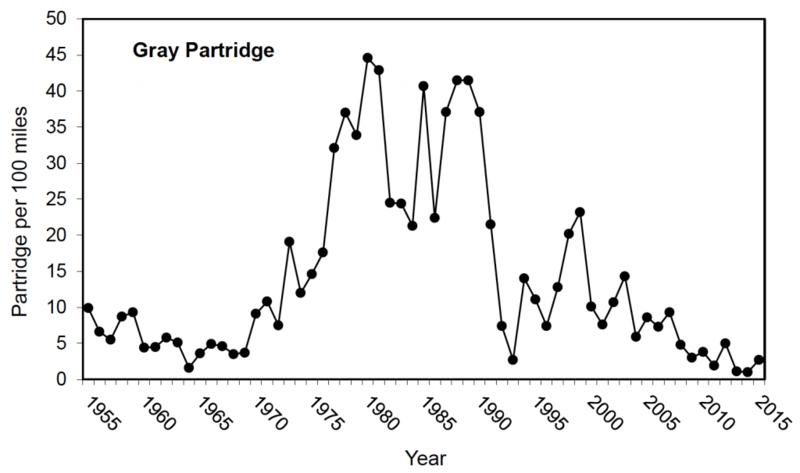 However, since the 1970s, Minnesota’s Gray Partridge distribution has not changed extensively, but populations have declined since the late 1980s (Davros 2015). Similar changes occurred in Wisconsin (Cutright et al. 2006). In Ontario its probability of occurrence had declined by 44% from the first atlas (1981–1985) to the second atlas (2001–2005) (Cadman et al. 2007). In Michigan the species was not mentioned in its first breeding bird atlas (1983–1988) despite previous nesting records (Brewer et al. 1991). It was also not reported during its second atlas (2002–2007) (Chartier et al. 2013). Breeding distribution of the Gray Partridge in Minnesota based on the Breeding Bird Atlas (2009 – 2013). Summary statistics of observations by breeding status category for the Gray Partridge in Minnesota based on all blocks (each 5 km x 5 km) surveyed during the Breeding Bird Atlas (2009-2013). Summary statistics for the Gray Partridge observations by breeding status category for all blocks and priority blocks (each 5 km x 5 km) surveyed during the Minnesota Breeding Bird Atlas (2009-2013). The Gray Partridge can be found in agricultural fields and grasslands, shelterbelts, and roadsides (Carroll 1993). In his habitat review, Allen (1984) repeatedly mentioned the importance of idle cover types—those not subject to grazing or crop or hay production. These included rights-of-way, idle and active farmsteads, shelterbelts, fence lines, irrigation ditches, and field edges. He also mentioned the importance of interspersion of cover types, where the species uses smaller activity ranges that result in higher densities and overall larger populations, though minimum habitat areas for a covey were reportedly 4 ha in North Dakota. Mettler (1977) emphasized that wildlife biologists know the Gray Partridge as a “dry land bird” and a “bird of open country,” but it preferred higher vegetation for nesting than the Ring-necked Pheasant. Habitat suitability models indicate that it preferred to nest in vegetation at least 46 cm tall (Allen 1984). Mettler (1977) reported that the statewide average was 18 birds per 100 miles based on roadside counts in 1941. Counts were low in the 1950s and 1960s, generally ranging fewer than 10 birds per 100 miles; however, they began to rise in the late 1960s (Davros 2015). High counts of 20–45 birds per 100 miles were recorded in the late 1970s to the late 1980s, but counts of less than 5 birds per 100 miles have been reported since 2008 (Figure 4). As previously mentioned, the Gray Partridge prefers dry habitat conditions, so years of high precipitation negatively affect population levels of this species. The federal Breeding Bird Survey (BBS) trends for Minnesota are too unreliable, but among the few estimates that are satisfactory in North America include North Dakota and the Prairie Pothole Region. Each shows a nonsignificant decline of 2.47% per year in North Dakota and 1.48% per year in the Prairie Pothole Region (Figure 5). The BBS indicated relatively low population densities across most of North America, with the highest populations in southern Saskatchewan and southwestern Alberta, plus parts of northern Montana (Figure 1). Its distribution in Minnesota, based on the BBS, compared favorably with the Minnesota atlas and indicated low densities of less than 1.0 detection per route per year. Rangewide index of the Gray Partridge as seen per 100 miles driven in Minnesota, 1955–2015, during August roadside surveys. The northwest region is not included (from Davros 2015, p.14). Breeding population trend for the Gray Partridge in the Prairie Pothole Region from 1966–2015 based on the federal Breeding Bird Survey (Sauer et al. 2017). As an introduced species, the Gray Partridge is of minimal conservation concern, but it is of considerable interest to management as a game species. Intensive agricultural management that reduces the availability of cover, food, and nesting sites are detrimental (Carroll 1993). Agricultural pesticides have caused direct mortality to the species. Indirectly, pesticides affect adult and chick survival due to reduced availability of weeds and insect foods during the nesting season and beyond. Hay mowing reduces available habitat as well as causing mortality, especially if performed early in the season or too frequently. Mettler (1977) emphasized that the population levels of the Gray Partridge are likely affected by multiple factors. She lists its hardiness in winter and its large clutch size as positives compared with the Ring-necked Pheasant. Dry summers are also a positive because wet summers cause “mud-balling” on the legs of young and reduce their mobility. Like Carroll (1993), Mettler does not consider hunting a major factor because it is a limited quarry, primarily only incidentally hunted while hunting other species. It is also a challenging species to hunt because of its smaller size and explosive flushing behavior. Allen, Arthur W. 1984. Habitat Suitability Index Models: Gray Partridge. Biological Report 82(10.73). Washington, DC: U.S. Department of the Interior, Fish and Wildlife Service. Mettler, Bonnie J. 1977. 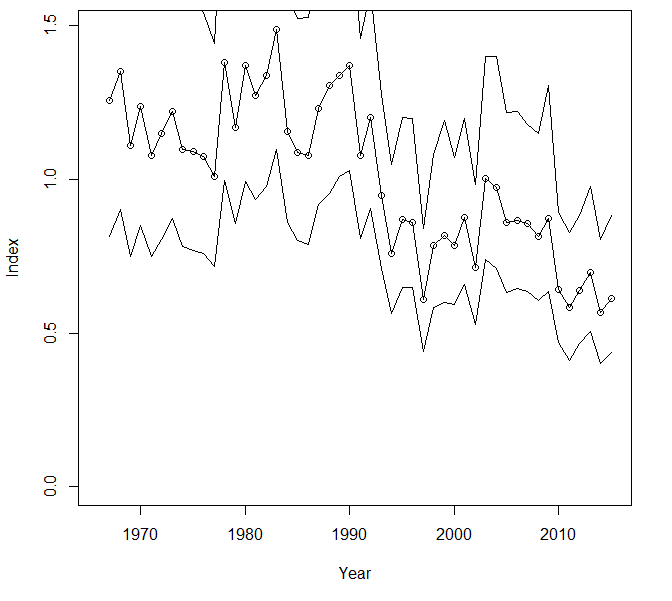 “Factors Contributing to the Increase of the Gray Partridge in Minnesota.” Loon 49: 205–210. Spiker, Chas J. 1929. “The Hungarian Partridge in Northwest Iowa.” Wilson Bulletin 41: 24–29.